Home / ingredients / What is a Lotion Bar & How to Use it? Many years ago I was introduced to Lotion Bars as an alternative to making liquid lotions and creams. I had tried making creams in the past but the whole process of the oil phase and the water phase and using an emulsifier to get them to mix seemed really tricky. And then you had to use a preservative and no there is no natural preservative out there. Vitamin E is an anti-oxidant preventing oils from turning rancid and does not kill bacteria. Water based products always need a preservative and also need to be tested before sale. Lotion Bars seemed a great product to make as the formula is basically beeswax, oils and butters like Shea and Cocoa Butter. No water, so no preservative needed. They are solid and no are not used with water as I have been asked that question also. They work by rubbing them between your hands (like a bar of soap)…..this transfers the lotion to your hands and then rub the lotion into your dry skin everywhere. The natural warmth from your skin softens and melts the lotion for application. I have found that Lotion Bars are less greasy than liquid lotions and do not take as long to absorb into your skin. They are completely natural with no preservatives. 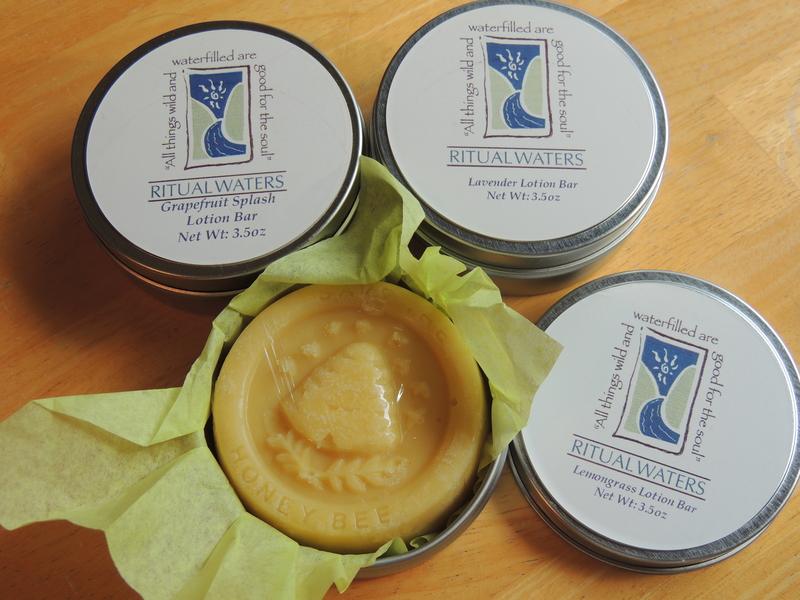 With the addition of beeswax and solid body butters they last a good long time. The ones we sell come in reusable tin containers that make them easy to carry along wherever you go including right onto the plane! Lotion Bars are a great way especially for the winter to form a good protective barrier for your skin. I often get cracks on my fingers especially when that cold dry air hits them and Lotion Bars are a great way to moisturize them. If your feet whether in summer or winter get cracks in your heels, run the bar on the soles of your feet at bedtime and put on clean white socks and you will be amazed how they feel in the morning. Lotion Bars can also soften cuticles on your hands also. But also try this on your dry legs after shaving, apply the lotion bar and see how soft your legs can feel. You can use these bars anywhere you would normally use a liquid lotion. Try it once and you may never go back! You can check out our Lotion Bars here. How do you make lotion bars? And 2 what is fractionated. What does it mean? Great explanation, I had to share.